Draft: 2010, Baltimore Orioles, 1st rd. Manuel Arturo Machado...married to Yainee, who is the sister of former Padres first baseman and current member of the Chicago White Sox, Yonder Alonso...Yonder, who Manny considers his best friend, introduced Manny to Yainee in 2009, when the three of them went to lunch one day after classes at the University of Miami...Yonder had taken Manny under his wing and while they were training for the season together, Manny and Yainee became friends...in 2011, Yonder invited Manny to join them on a family vacation in Spain, and it was at that time when Yainee and Manny started dating...the couple married on in the offseason in 2014 in Angers, France, right outside of Paris...they have one dog named "Kobe" (named after Kobe Bryant)...he graduated from Brito Miami Private High School and was drafted third overall by the Orioles in 2010 after batting .639 his senior season...Manny's grandfather, Francisco Nuñez, had the largest impact on his passion for baseball...he passed away during his senior year of high school and Machado writes his initials (FN) in the infield dirt as he takes the field every game. Acquired by LAD from BAL on 7/18, a day after the All-Star Game for their postseason run...appeared in the playoffs for the third time and first since 2016 with BAL...In 162 combined games between BAL and LAD, recorded his first career 100+ RBI season (107) and matched his career high with 37 HR (also: 2016)...hit .297 (188-for-632) with 35 doubles, three triples and 84 runs scored along with 14 SB, .905 OPS and a 6.2 WAR (FanGraphs)...One of only seven players to play in all 162 games in 2018 while also ranking among the Top 10 in several categories, including intentional walks (18, 3rd), hits (188, T-3rd), total bases (340, 4th), multi-hit games (54, T-6th), game-winning RBI (14, T-7th), RBI (T-8th), home runs (T-9th), and runs created (116, 10th)...Held the longest on-base streak in the majors in 2018 with a careerhigh 33-game mark from 6/27-8/2…during the run, he posted a .328/.427/.566 slash line with six doubles, one triple, seven HR, 15 RBI, 17 runs and five SB...Selected to his fourth All-Star Game (also: 2013 and '15-16) and named the starting shortstop (second All-Star start) after batting .315 with 21 doubles, 24 HR and 65 RBI in 96 games for BAL before the All-Star break...In the first half of the season, he ranked among AL leaders in RBI (T-4th), SLG (.575, 5th) OPS (.963, 5th), hits (115, T-5th), AVG (6th), HR (6th) and OBP (.387, 9th)... according to ESPN Stats and Info, Machado joined Alex Rodriguez, Arky Vaughan, and Cal Ripken, Jr. as the only players to start an All-Star Game at third base and shortstop...Acquired by LAD from BAL on 7/18 in a six-player trade...led LAD in the second half of the regular season in hits (73), RBI (42) and at-bats (267) while ranking tied for the club lead in HR (13), second in runs (36) and games (66) and tied for second in doubles (14)...LAD went 40-28 in the second half after acquiring Machado and he finished the regular season with a 10-game hitting streak, going 13-for-40 (.325) with two doubles, one triple, two HR, 11 RBI, five runs and a .947 OPS...Hit a two-run HR in the first inning in Game 2 of the NLDS against ATL for his second-career postseason longball and his first since 10/10/12 in Game 3 of the ALDS at NYY with BAL...Recorded his first-career multi-hit postseason game in Game 4 of the NLDS, including a three-run HR to seal the victory in the seventh inning...Hit his third HR of the postseason to give LAD a 1-0 lead in the second inning in Game 1 of the NLCS at MIL, making him the fourth player in Dodgers' history to homer in three of the team's first five postseason games, joining Manny Ramirez (2008), Davey Lopes (1978), Steve Garvey (1978), and Duke Snider (1955)...Drove in three of the four Dodger runs in Game 1 of the World Series…reached base safely in 13 out of 16 postseason games...Put up similar numbers versus right and left-handed pitchers, posting a .297/.386/.535 slash line against southpaws and a .298/.358/.593 slash line against righties…his batting average and .921 OPS against lefties both ranked the seventh best in the majors (min. 200 PA)...Hit .331 with RISP, which ranked seventh in the majors (min. 150 PA in that situation)…also batted .303 with runners on base…in close and late situations, he hit .309 (30-for-97), while posting a .333 AVG in the seventh inning or later. His 95 RBI ranked 13th-most in the AL...Led the Orioles with 33 RBI in the seventh inning-or-later for fifth-most in the AL...Appeared in all six of Team Dominican Republic's World Baseball Classic games…Batted .321 (7-for-26) with one home run, two doubles, two RBI, and four runs scored...Named AL Player of the Month for August, his second career AL Player of the Month award (also April 2016)...In 29 games in August, he hit .341 (43-for-126) with six doubles, one triple, 12 home runs, and 35 RBI...He ranked first in RBI, extra-base hits (19), and total bases (87), and tied for first in home runs in the AL during this span... One of three infielders in baseball (excluding first baseman) who has hit 30-or-more home runs in three-straight seasons (Donaldson and Arenado)...Named AL Player of the Week for the week of 8/14-20 as he hit .385/.370/.885 (10-for-26) with four home runs and 12 RBI...He led the AL in RBI and tied for first in home runs... Matched his single-game career-high with three home runs and seven RBI on 8/18 vs. LAA (also 8/7/16 at CWS)...Homered five times in the six-game homestand (8/18-23), including two walk-off home runs (8/18 and 8/23)...His 12 home runs in August were a career-high for a single month...Hit a walk-off grand slam on 8/18 vs. LAA, his third homer of the game...He became the 13th player in Major League history with three home runs in a game with the last one being a walk-off...According to the Elias Sports Bureau, prior to Machado, only one player in Orioles history has produced multiple walk-off home runs in a span of six-or-fewer days (Fred Lynn, 5/10-11/85)...Hit three grand slams in 2017...His six grand slams from 2016-17 are the most in the majors...According to the Elias Sports Bureau, he became just the 10th player in Major Leauge history (first in Orioles history) to hit three grand slams in one calendar month... Recorded five doubles in three games (7/30-8/1), his most in a three-game span in his career...Hit a Major League-leading three walk-off home runs (9/5 vs. NYY, 8/23 vs. OAK, and 8/18 vs LAA)...In 26 games in July, he hit .327 (34-for-104) with eight doubles, three home runs, 16 runs, and 15 RBI... Left 6/7 vs. PIT in the top of the fourth inning with left wrist soreness...Hit four home runs over the 4/28-5/4 road trip (seven games) matching his career-high for a single road trip...His home run on 6/2 vs. BOS (Porcello) reached the second deck in left field of Oriole Park ...It was the first home run by an Oriole that reached the second deck in left field since Mark Reynolds did so on 8/7/11 vs. TOR (Romero). Selected to the 2016 All-Star Game, his third career All-Star selection (also 2013 and 2015)...Elected the starting third baseman by fan balloting (0-for-3)...Finished ffth in AL MVP voting...Voted the winner of the Louis M. Hatter Most Valuable Oriole Award by members of the local media...Became the first Orioles player to log four games with five or more RBI in a season since Miguel Tejada (2004), matching the club record also held by Jim Gentile (1960)...According to the Elias Sports Bureau, his three grand slams were the second-most by an Oriole in a season...Four other Orioles have hit at least three grand slams in a season. Jim Gentile (five in 1961), Reggie Jackson (three in 1976), Eddie Murray (three in 1985), and Chris Hoiles (three in 1998)...Hit his 100th career HR on 8/30 vs. TOR, becoming the fastest Oriole (in terms of age) to reach the 100 career home run plateau at 24.055...Eddie Murray (1980) did so at age 24.177...Became the third-fastest Oriole in terms of games played to reach the 100 career home run plateau (578 career games), behind only Boog Powell (564) and Chris Hoiles (577)...Posted his ninth career multi-home run game on 8/26 at NYY (2-for-4, 2 HR, 3 RBI)... Was one of four Orioles to homer in the first inning on 8.19 vs. HOU before the Astros recorded an out (first time in Major League history since 1900, according to STATS, LLC. )...Went 3-for-6 with three home runs and seven RBI on 8.7 at CWS, homering in the first, second, and third innings - the 19th game in club history an Oriole recorded seven or more RBI (14th different Oriole)...According to STATS, LLC., became the second player in Major League history to homer in each of the first three innings of a game (Carl Reynolds, CWS on 7.2.30 at NYY...Became the ninth player in Major League history to homer in three consecutive innings and first since Kevin Mench (TE;) on 6/30/05 vs. LAA (STATS, LLC. )...His three-homer game on 8/7 at CWS was the 21st game in club history an Oriole has hit three or more home runs (16th different Oriole to accomplish the feat)...Served a four-game suspension after charging the mound following being hit by a pitch on 6/7 vs. KC by Yordano Ventura...Appeared in 45 games (43 starts) at shortstop, mostly from 5/1-6/17, due to an injury to J.J. Hardy...Hit 11 home runs as a shortstop and 26 home runs as a third baseman, the first Orioles player to homer at least 10 times from each position in the same season...Became the second player in Major League history to homer at least 10 times as a shortstop and 20 times as a third baseman in the same season (also Howard Johnson, NYM in 1989; 26 HR as 3B, 10 HR as SS)...Posted a career-high 16-game hitting streak from 4.4-23 (.397..446..779), becoming the first Oriole to hit safely in the club's first 16 games of a season...Named AL Player of the Month for April, batting .344 (33-96) with 10 doubles, seven home runs, 16 RBI, and 20 runs scored over 23 games...Played his 500th career game on 5.30 vs. BOS...Logged 211 extra-base hits within his first 500 games, passing Cal Ripken, Jr. (208) for the Orioles record (STATS, LLC. )...Started at third base in the 2016 AL Wild Card Game at Toronto (1-for-4). Earned his second career Rawlings Gold Glove Award for defensive excellence at third base • Led all American League third basemen in total chances (488), double plays (38), Range Factor per 9.0 innings (3.09), and Range Factor per game (3.01) in 2015...Ranked second in assists (337) and putouts (132), as well as fourth in zone rating (.810) • According to FanGraphs, he finished second among American League third basemen with 14 defensive runs saved, and third in defensive runs above average (10.8) and ultimate zone rating (8.4) • Was the only player in Major League Baseball to play in all 162 regular season games and was the first Oriole to accomplish the feat since Adam Jones in 2012 • Notched the seventh 20/20 season (HR/SB) in Orioles history, 10/1 vs. TOR...Posted the second 30/20 season (HR/SB) in Orioles history (B. Anderson, 1996, 50/21) • Ranked 10th among AL hitters in home runs (35), 11th in slugging percentage (.502), 19th in on-base percentage (.359), and 20th in batting average (.286) • Led AL third basemen in total chances per 9.0 inn. (3.21), Range Factor per 9.0 inn. (3.09), and Range Factor per game (3.01) • Finished second among AL third basemen in assists (337), putouts (132), putouts per 9.0 inn. (0.87) and assists per 9.0 inn. (2.22), and fourth in Zone Rating (.810) • Homered in a career-high four consecutive games, 9/30 (GM2)-10/3 (five homers in that span)...It was the longest such stretch by an Oriole since Caleb Joseph hit home runs in five straight games, 8/2-9/14 • Became the second-youngest (23.079) Oriole to hit 30 homers in a season (behind only Boog Powell (22.360) in 1964) after slugging his 30th homer on 9/23 at WAS • Logged his 500th career hit with a single in the fifth inning on 9/22 at WAS • Became the youngest Oriole to reach 100 career doubles (23.057), surpassing Cal Ripken, Jr. (23.332)...He accomplished the feat in the second-fewest games played (421) • Made his first Major League start at shortstop on 8/31 vs. TB (his first professional start at shortstop since 8/8/12 with Double-A Bowie) • Made his first Major League appearance at shortstop in the top of the 12th inning on 8/23 vs. MIN • Hit his second career walk-off home run on 8/14 vs. OAK (also, 7/29/14 vs. LAA)...It marked his third career walk-off hit • His longest hitting streak of 2015 was 12 games from 6/18-30 (.412, 21-for-51, six doubles, three home runs, and 11 RBI) • According to the Elias Sports Bureau, he became the first Oriole to hit multiple walk-off homers in the 12th inning or later after homering in the 13th inn. on 8/14 (also, 7/29/14 vs. LAA, B12) • According to the Elias Sports Bureau, he became the second Oriole in the last 30 years to hit at least 20 home runs at age 23 or younger (also Nick Markakis, 23 home runs at 23 years old in 2007) • Named a player selection to the 2015 All-Star Game, his second career All-Star Game selection (also, 2013) • Competed in the Home Run Derby (No. 5 seed) and was defeated by Joc Pederson (No. 4 seed) in the first round of the bracket format, 13-12 • Went 1-for-2 with an RBI-double and a run scored in the All-Star Game, driving in B. Holt in the seventh inning to give the AL a 4-2 lead...Played 4.0 innings at third base • Led AL qualifying hitters with 42 hits in June, finished second in batting average (.365), fourth in RBI (22), tied for fifth in OBP (.411), and fifth in SLG (.635) • Named AL Player of the Week for the period ending 6/14 after batting .458 (11-for-24) with one double, two home runs, and five RBI (second career AL POW honor, also 8/12/12). Began the season on the 15-day DL, retroactive to March 21, recovering from left knee surgery...Reinstated from the DL, May 1, and made his season debut that night in game two of a doubleheader vs. PIT...Batted .210/.263/.276 in his first 26 games (May 1-30), before finishing the season batting .311/.353/.505 with 10 HR and 27 RBI in his final 56 games (May 31-August 11)...Hit 1st career grand slam, June 1 vs. HOU (Feldman)...Had a career-high 19-game streak of reaching base safely, June 22-July 20, during which he batted .389/.436/.694...Suspended five games, June 30-July 5 (G1) for "intentionally throwing his bat on the field" in the 8th inning on June 8 vs. OAK...Collected a career-high five hits on July 7 after turning 22 years old the day before, becoming the youngest Oriole (22.001) with a five-hit game since Cal Ripken, Jr. (21.363), August 22, 1982...Hit his 1st career walk-off HR, July 29 vs. LAA, giving the O's a 7-6 win in 12 innings...Suffered a right knee injury on August 11 vs. NYY and was placed on the 15-day DL, retroactive to August 12, with a right knee sprain...Had surgery on August 27...Transferred to the 60-day DL on September 2. Ranked the #2 prospect in the O's system and the #11 prospect in all of baseball by Baseball America following the season...Split the season between Single-A Delmarva and Frederick...In the second half with the Keys, was 58-for-237 (.245) with three triples, five home runs, 22 walks and eight stolen bases in 63 games...Machado was named the MVP of the Mills Cup with a home run and seven RBI...Overall in the playoffs, he went 11-for-32 (team-high .344) with 9 RBI, 11 hits, four doubles, a home run, five extra-base hits, a .447 on-base percentage, .563 slugging percentage and eight runs scored. Was named the best prospect in the Orioles organization by Baseball America following the 2010 season...Homered for his first professional hit in his second career game August 28 against the DSL Rays...Was promoted to Aberdeen on August 29...Hit safely in all seven games with the IronBirds, including three multi-hit contests. 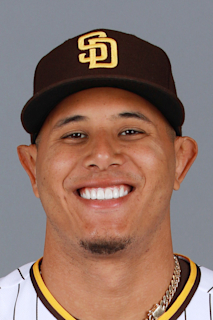 February 21, 2019 San Diego Padres signed free agent 3B Manny Machado. October 29, 2018 SS Manny Machado elected free agency. July 20, 2018 Los Angeles Dodgers activated SS Manny Machado. June 24, 2016 Baltimore Orioles activated SS Manny Machado. June 19, 2016 3B Manny Machado roster status changed by Baltimore Orioles. November 3, 2014 Baltimore Orioles activated 3B Manny Machado from the 60-day disabled list. September 2, 2014 Baltimore Orioles transferred 3B Manny Machado from the 15-day disabled list to the 60-day disabled list. July 5, 2014 Baltimore Orioles activated 3B Manny Machado. June 30, 2014 3B Manny Machado roster status changed by Baltimore Orioles. May 1, 2014 Baltimore Orioles activated 3B Manny Machado from the 15-day disabled list. April 25, 2014 Baltimore Orioles sent 3B Manny Machado on a rehab assignment to Frederick Keys. November 1, 2013 Baltimore Orioles activated 3B Manny Machado from the 60-day disabled list. September 25, 2013 Baltimore Orioles placed 3B Manny Machado on the 60-day disabled list retroactive to September 24, 2013. Torn medial patellofemoral ligament in left knee. September 25, 2013 Manny Machado roster status changed by Baltimore Orioles. August 9, 2012 Baltimore Orioles selected the contract of 3B Manny Machado from Bowie Baysox. July 13, 2012 Manny Machado roster status changed by Bowie Baysox. July 7, 2012 Bowie Baysox placed SS Manny Machado on the temporarily inactive list. April 5, 2012 SS Manny Machado assigned to Bowie Baysox. March 5, 2012 SS Manny Machado assigned to Baltimore Orioles. July 13, 2011 Frederick Keys activated SS Manny Machado from the temporarily inactive list. July 9, 2011 Frederick Keys placed SS Manny Machado on the temporarily inactive list. June 22, 2011 SS Manny Machado assigned to Frederick Keys from Delmarva Shorebirds. June 5, 2011 Manny Machado roster status changed by Delmarva Shorebirds. May 7, 2011 Delmarva Shorebirds placed SS Manny Machado on the 7-day disabled list retroactive to May 6, 2011. April 7, 2011 SS Manny Machado assigned to Delmarva Shorebirds from Aberdeen IronBirds. March 23, 2011 SS Manny Machado assigned to Baltimore Orioles. August 29, 2010 Manny Machado assigned to Aberdeen IronBirds from GCL Orioles. August 25, 2010 Manny Machado assigned to GCL Orioles from Baltimore Orioles. August 16, 2010 Baltimore Orioles signed SS Manny Machado.